The soaps arrived promptly and are absolutely lovely! Purchase six months worth of soap with Greenwich Bay Trading's assortment of French-milled, luxurious vegetable soaps enriched with shea butter, essential oils and natural extracts in captivating botanical scents. Madame Earth is committed to encouraging an all natural outer beauty lifestyle, beginning with the basic everyday bath. Check out Madame Earth jewelry made from semi precious gemstones from some of the most beautiful regions of the world. If a rash should form discontinue use. Avoid contact with eyes. 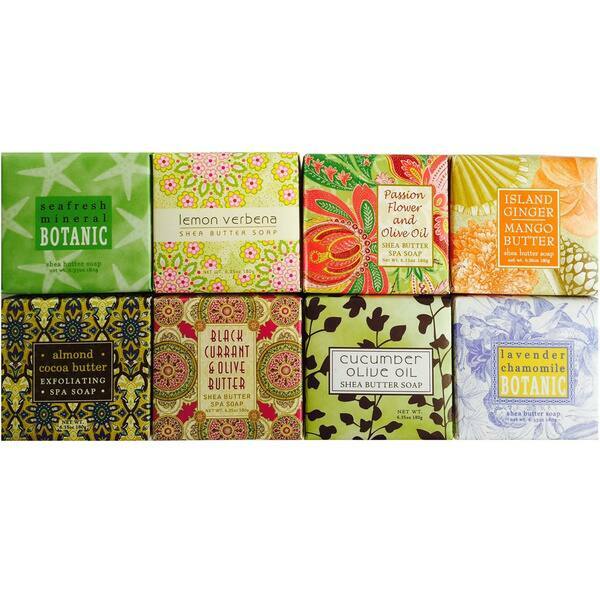 These soaps are beautiful and all the different combinations smell amazing. They're all natural and made a really nice gift for my Secret Santa recipient.